Last year Woodseats Musical Theatre converted me to the delights of the jukebox musical so I was delighted to be in the audience for the opening night of their latest production Disco Inferno, a high energy musical set in the 1970s that promised to get audiences feet tapping and give them a night to remember. 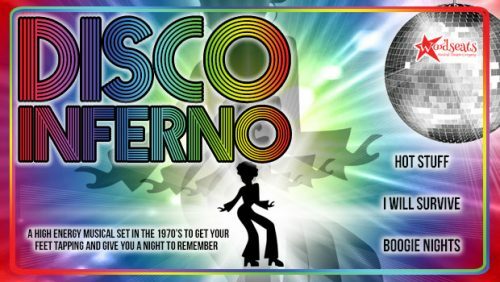 Set in Northern England in 1976, a year whose summer was even hotter than this one, Disco Inferno is a fun and devilishly discotastic musical that is the perfect escape from the heat and the football, full of hilarious jokes, dance routines and 25 feel-good hits straight out of the 1970s and a great twist in the tale. The show should not be missed by anyone looking for a fun night out at the theatre full of great songs they will know and love, great characters, great performances and a great story reminding us all to be careful what we wish for, and to read the small print. I cannot review this show without out highly praising the show’s leads, James Worthington as Jack and Ellie Needham as Jane, whose performances, vocals, stage presence, chemistry and bringing to life their young love on stage cannot help but remind audience members of Zac Efron and Vanessa Hudgens if they were magically transferred from High School Musical to 1970s England. In a cast where the chemistry and friendship between the characters shone through, the other stand out performances for me came from Alex Haywood Browne as Duke, who was truly channelling actor Matt Berry in disco owner/devil form; Naill Wragg as Tom, the musical’s loveable version of Buttons in an Elvis wig, who along with getting the best comic lines of the night, gave a performance that both reminded me of and could not have been performed better by Hearsay’s Noel Sullivan. Other characters I must give a special mention to include James Parkin as Heathcliffe who brilliantly combined a northern men’s club singer’s voice, attitude and ambition with the looks of Rod Stewart; and Clair Stokes as Nic Diablo who stylishly and quirkily pulled off a 1970s Ab Fab Edina that Jennifer Saunders would be proud of. Stand out musical numbers, in the order they appear in the show, were Elsa Russell’s (as Kathy) soulful performance of “Street Life”; Clair Stokes quirky performance of “Pop Muzik”; James Worthington’s stunning vocal impression of David Bowie’s “Starman”; Ellie Needham’s powerful and emotional rendition of “I Will Survive” that got every woman in the audience on her side; and the attitude packed duet of “Saturday Night’s Alright For Fighting” from James Parkin and Tara Kulbatski (as Lady Marmalade). Performing since 1945, Woodseats Musical Theatre Company are a vibrant, friendly company who aim to present first class shows and concerts at local theatres and venues in Sheffield. For further information visit www.woodseatsmtc.co.uk. 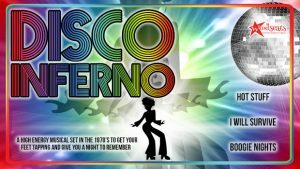 Disco Inferno will be performed at the Montgomery Theatre until Saturday 14 July at 7.30pm with an additional 2.30pm matinee on the Saturday. Tickets are £13. To book visit http://themontgomery.org.uk.